0 Comments Published by KL Ocs Kid on Wednesday, October 24, 2007 at 10:37 AM. Referee Mark Clattenburg will miss this weekend's Premier League action because of a planned holiday and not as a result of criticism after last weekend. Everton complained over his handling of Saturday's Merseyside derby, when he sent off Tony Hibbert and then only booked Liverpool striker Dirk Kuyt. Kuyt stayed on after a two-footed lunge at Phil Neville and his second penalty give Liverpool a 2-1 win. 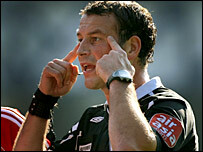 Refereeing officials said Clattenburg had already planned to take a break. He will be refereeing Thursday night's UEFA Cup game between Lokomotiov Moscow and Atletico Madrid. After the Kuyt incident, Everton were further enraged when Clattenburg ignored their claims for a penalty moments later. Liverpool defender Jamie Carragher appeared to haul Joleon Lescott to the ground as Everton's nine men fought for an equaliser. Neville has called on referees to be more consistent when making key decisions. "Dirk Kuyt is not a malicious player but the bottom line is that he should have been sent off," the Everton captain told his club website evertonfc.com. "We've had instances this season where players have been booked for the most trivial of incidents. "But when you see a leg-breaking tackle like that one receive the same punishment that's when you get upset. "We just want referees to be consistent. We have had officials come into our changing rooms this season and explain the rules. "Two feet off the ground is a red card. That's why the players, the manager and our supporters feel so let down. "This isn't asking for favouritism. We just want consistency and tackles like that to be outlawed."